Do you LOVE color? If you do, and you love bold design, then it is a pretty safe bet that you love Kaffe Fassett fabrics! 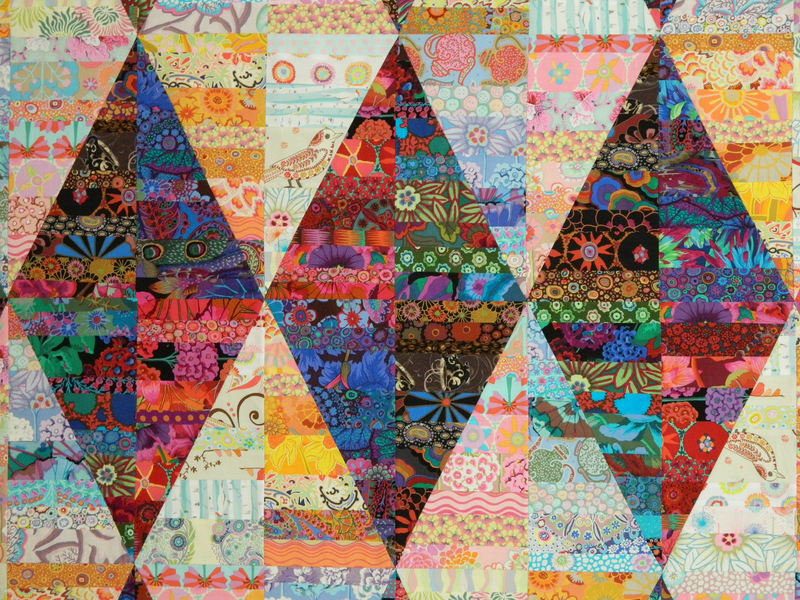 A couple of years ago my daughter Kaitie spied this quilt on the cover of Kaffe Fassett's "Simple Shapes Spectacular Quilts" book. The book caught her eye from across the store, which is easy to imagine why when it comes to Kaffe Fassett. We both loved the pattern, which he calls Facet. I never would have been brave enough to cut all those big beautiful prints into little strips if I had not seen this book first. It took me a year and a half to gradually collect the fabrics. There are more than 80 different fabrics: mostly Kaffe Fassett, with some Phillip Jacobs, Tula Pink, Amy Butler and coffee themed prints thrown in. It is a diamond shaped string quilt. Not hard to make at all and lots of fun to play with all those fabrics! Can you see some of your favorites in there? 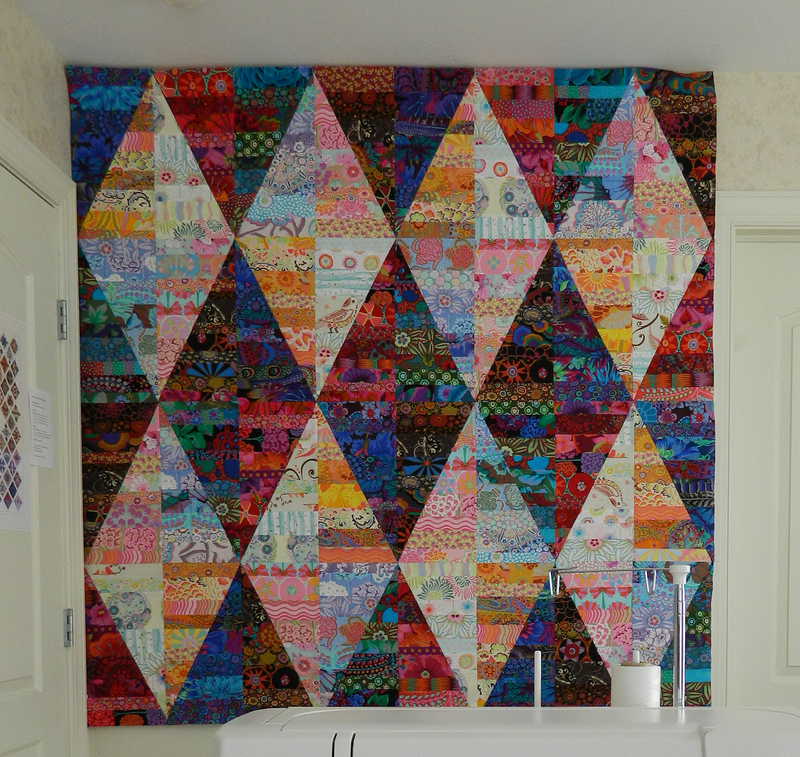 The picture below is of the quilt top while it was on the design wall, before I sewed on the zig-zaggy border. I had a little help from my friends: Julie DeGrave (Pines and Needles Quilting) quilted the quilt in a beautiful swirling all over design and Dawn (sewnsewer2 on The Quilting Board) made the beautiful label for us. Those of you who are Princess Bride fans know what "As You Wish" means. Kaitie looks pretty pleased, doesn't she?! I love the saturated colour you get working like this. It always seems made chopping lovely fabric up into tiny strips, doesn't it, but it really works well. WOW! LOVE KF and this is spectacular! That border fabric finishes the quilt perfectly!! For me, it will forever be "comme vous voudrez..." ! Did you have problems with fabric shifting while sewing your diamonds ? Did you starched them, or user paper foundation ? Hi Chantal! Why does everything sound more deep and meaningful when you say it in French? LOL "comme vous voudrez..." I like that! It was a worry that the fabric would stretch, since the diamond edges are cut along the bias grain. So I followed Kaffe's suggestion and starched the fabrics. I did this to all of them before cutting out the strips and then once again I starched the rectangles before cutting them into triangles for each quarter of the diamond. This eliminated any trouble with the fabrics shifting or stretching out of shape. Stunning! Bold is how I sew! Lara, love these quilts! You do such beautiful work and your suggestions and ideas are so helpful! I am very fond of Kaffe Fassett, materials and design, I own many of his fabrics and many of his books. I must say you did a fantastic job mixing his fabrics with other designer' fabrics, not easy. Your quilt is gorgeous!! Wow! Stunning! Love it! We definitely share a love of colour. Isn't it great when our children take an interest in quilting! I have all mine hooked and I am working on the next generation. Princess Bride is one of our favourite shows! 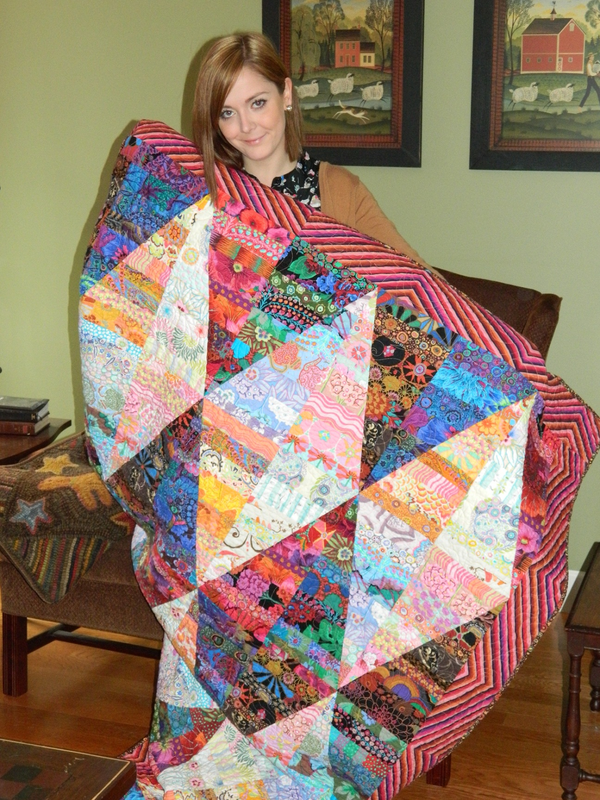 Your quilt is wonderful and Kaitie so pretty! I like everything in this quilt, the colors of course, the strong contrasts the scraps and the border! I love Kaffe Fassett as a designer and I own several of his books. 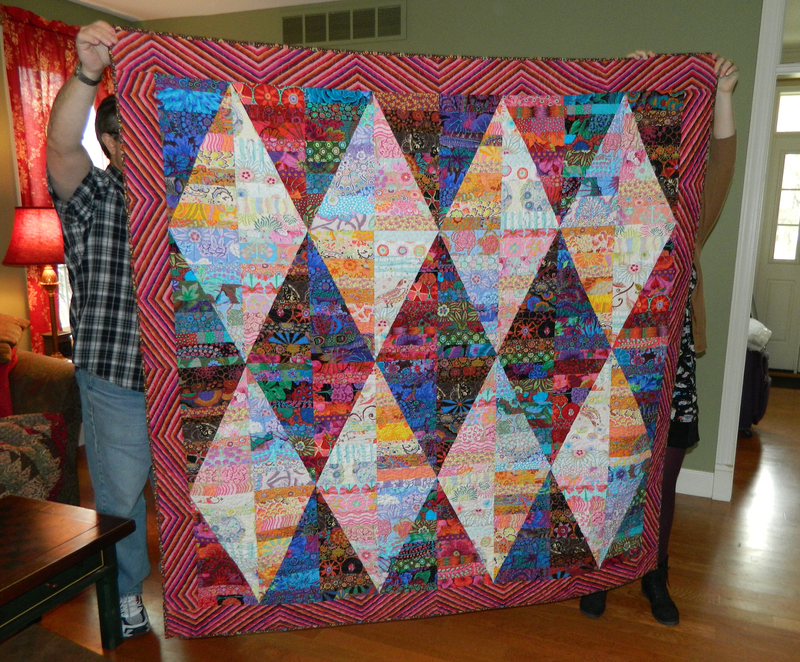 I did two quilts with KF fabrics : the fans and the spools. I love this quilt, I love KF fabrics too! Very nice pattern and excellent execution, okay it is well made!lol Just love to sit and look at it. I know she loves it too. This quilt is really striking. Love the fabric placement and your choice of fabrics is beautiful. Your bravery certainly has paid off. That is beautiful! It looks like you started with rectangle blocks made of strings and then cut them into triangles. I love the look it created! It truly is eye catcher! Well done! Love the contrast between lighter and darker shades. Your fabric placement is wonderful! Beautiful quilt! I just love this scrap happy quilt right down to its name. What a beauty! I can see why you'd have been nervous cutting into all those lovely prints, but the end result is so worth it! Way to go! I love when I get to see how versatile Kaffe fabrics are! 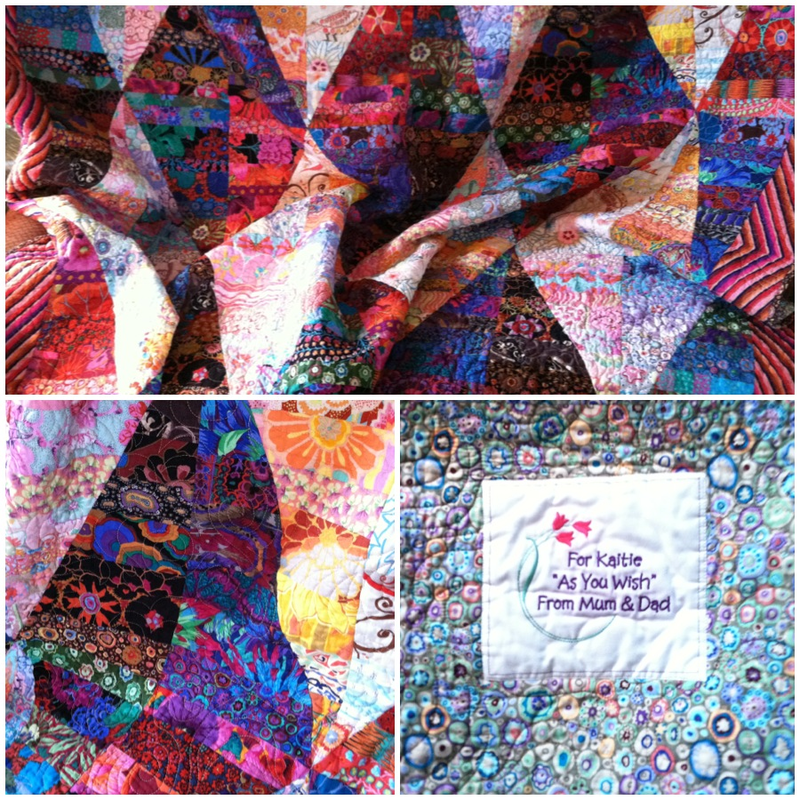 I love the vibrant colors of this quilt! The rich colors offset by the pastels is truly original. I also am a "Princess Bride" fan and love that quote. A gorgeous quilt for a gorgeous girl. Definitely a labour of love! That is a beautiful quilt. Thanks for the inspiration, I have some kona solids that I might do the same thing with! It is nice to see your daughter with her new quilt! She is so pretty! That is flippin' awesome! I am a huge string quilt lover and Kaffe fabrics puts it over the top in my book. Your daughter is adorable! OH. MY. GOD. "As you wish" indeed. I-love-this-I-have-to-make-one-oh-man!! You did such a spectacular job: of collecting the fabrics, and of placement, and of design...Love the border, and it's absolutely perfect, you know why? Because I did not notice it until I read "zig zaggy border"! And then I looked again, and audibly went "oh!" What an awesome quilt, good taste, Kaitie! I love the name of it too; you are so clever.